The former Leader of Sheffield Council and one of the city’s most well-known politicians is standing down. Paul Scriven – Ecclesall councillor and Baron Scriven of Hunter’s Bar – will not be seeking re-election to Sheffield Council when his term comes to an end in May. He’s spent a total of 15 years as a councillor, narrowly missed out on a Parliamentary seat and has repeatedly called for the House of Lords to be abolished despite being a life peer. The demands of splitting his time between Sheffield and London have become too much but Paul, originally from Huddersfield, says leaving the council will be a wrench. “My passion and the fire in my belly is local government and particularly in this city because I absolutely love Sheffield and I will be leaving in a wooden box. “I love its people and its nonconformity, its grit and determination, its friendliness and innovation. “Marrying local politics with a city I love has been a privilege but adding in the demands of my own business and the Lords is just too hard. Paul, 53, started his local political career in Sheffield in 2000 when he was elected in the Broomhall ward. He became Leader of the Liberal Democrat Group two years later and then Leader of the Council following the 2008 local elections when the Lib Dems took control from Labour. He said being Leader gave him a platform to shout about Sheffield’s achievements. “It was small things which mattered. Whenever I was in a different country I could shout up for Sheffield and be a champion for local businesses. “Being an adopted Sheffielder and living in this city I was in the position to give people opportunities so they could achieve their potential. At the 2010 general election, he was the Lib Dem candidate for Sheffield Central but lost to Labour’s Paul Blomfield by just 165 votes. His time as Council Leader came to an end in May 2011 when Labour regained control of the council and a year after that, he lost his Broomhill seat. 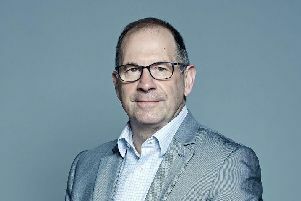 A close friend and supporter of former Sheffield Hallam MP Nick Clegg, Paul’s political career moved to the national stage when he became a peer in 2014. As a self-confessed maverick, he has butted heads with the establishment ever since. He got into trouble for refusing to wear a tie in the Chamber and has repeatedly called for the House of Lords to be abolished and replaced with a second elected chamber. For now, the Lords will be his political home although he has no plans to move from his Sheffield house and will continue to commute. He will also have more time to spend with his husband, Dr David Black, who he married in 2017 after 22 years together.